We killed two crabs today! I love crab, but had never prepared it before. In Malaysia, my brother is the one responsible to cut the crabs. In France, my father in laws would prepare. He knows I love crab and most of the time when we go their house, crabs will be on the menu. Today, we saw a promotion, 3.82 euros for 2 crabs. Bon marché. I asked an old man to choose for me. People are very friendly here and they are willing to help and share with you. I put the crabs in the fridge. It doesn't work bcos every time we open the fridge, we saw something moving and that disturbed us. Ooh, I wouldn't have wanted to do that either. Did they scream like lobsters do when you put them in hot water? No. They were struggling with their legs, but for several seconds only. I once saw my FIL boiled a crab. 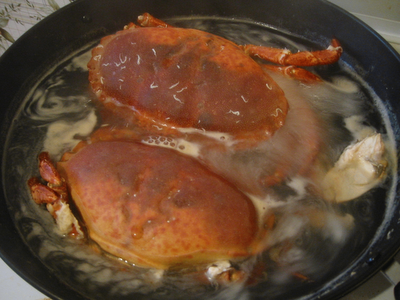 While waiting for the water to boil, the crab crawled actively in the kitchen. When he put it in the boiling water, it struggled strongly until he had to use the cover to force it inside the boiling pot. Nice civil servant in France: It exist!